Deconstructing Nuclear Experts: Are They Misleading Us On Fukushima? I saw him a few times talking down the accident on the television, labelled in the stripe as Professor Richard Wakeford, University of Manchester. Incidentally, Wakeford is a physicist, his PhD was in particle physics at Liverpool. But he was not presented as ex-Principle Scientist, British Nuclear Fuels, Sellafield. That might have given the viewers the wrong idea. Early on we saw another baddy, Malcolm Grimston, talking about radiation and health, described as Professor, Imperial College. Grimston is a psychologist, not a scientist, and his expertise was in examining why the public was frightened of radiation, and how their (emotional) views could be changed. But his lack of scientific training didn’t stop him explaining on TV and radio how the Fukushima accident was nothing to worry about. The doses were too low, nothing like Chernobyl, not as bad as 3-Mile Island, only 4 on the scale, all the usual blather. Most recently we have seen George Monbiot, who I know, and who also knows nothing about radiation and health, writing in The Guardian how this accident has actually changed his mind about nuclear power (can this be his Kierkegaard moment? Has he cracked? ) 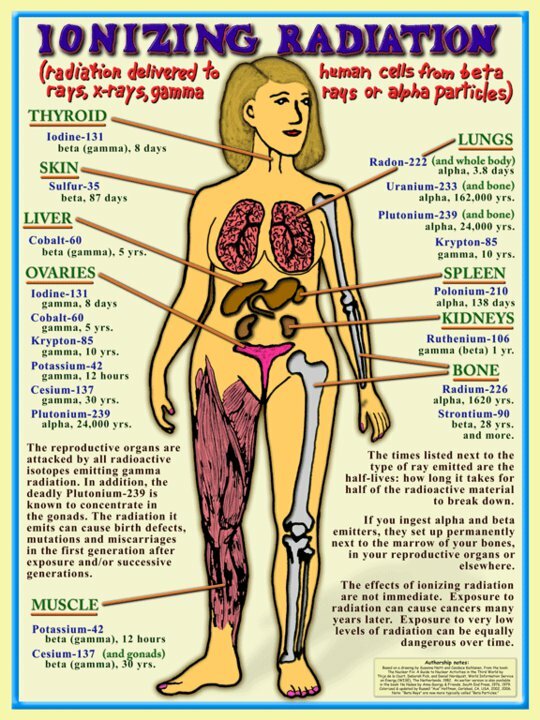 since he now understands (and reproduces a criminally misleading graphic to back up his new understanding) that radiation is actually OK and we shoudn’t worry about it. George does at least know better, or has been told better, since he asked me a few years ago to explain why internal and external radiation exposure cannot be considered to have the same health outcomes. He ignored what I said and wrote for him (with references) and promptly came out in favour of nuclear energy in his next article. "More than 10,000 people have died in the Japanese tsunami and the survivors are cold and hungry. But the media concentrate on nuclear radiation from which no-one has died - and is unlikely to." Then we move to 3-Mile Island: "There were no known deaths there." "The latest UN report published on 28 February confirms the known death toll - 28 fatalities among emergency workers, plus 15 fatal cases of child thyroid cancer - which would have been avoided if iodine tablets had been taken (as they have now in Japan)." "So what of the radioactivity released at Fukushima? How does it compare with that at Chernobyl? Let's look at the measured count rates. The highest rate reported, at 1900 on 22 March, for any Japanese prefecture was 12 kBq per sq m (for the radioactive isotope of caesium, caesium-137)." "A map of Chernobyl in the UN report shows regions shaded according to rate, up to 3,700 kBq per sq m - areas with less than 37 kBq per sq m are not shaded at all. In round terms, this suggests that the radioactive fallout at Fukushima is less than 1% of that at Chernobyl." "Patients receiving a course of radiotherapy usually get a dose of more than 20,000 mSv to vital healthy tissue close to the treated tumour. This tissue survives only because the treatment is spread over many days giving healthy cells time for repair or replacement. A sea-change is needed in our attitude to radiation, starting with education and public information." Prof Christopher Busby is a British scientist and activist known for his work on the health effects of ionising radiation. In addition to his academic appointments he is the director of Green Audit, an environmental consultancy agency and scientific advisor to the Low Level Radiation Campaign which he set up in 1995. Chris Busby is Scientific Secretary of the European Committee on Radiation Risk. He is visiting Professor at the University of Ulster and also Guest Researcher at the Julius Kuehn Institute of the German Federal Agricultural Institute in Braunschweig, Germany. He was a member of the UK Committee Examining Radiation Risk on Internal Emitters CERRIE and the UK MoD Depleted Uranium Oversight Board. He was Science and Policy Interface leader of the Policy Information network on Child Health and Environment based in the Netherlands. He has been the Science and Technology Speaker for the Green Party of England and Wales. He has conducted fundamental research on the health effects of internal radiation both at the theoretical and epidemiological level, including recently on the genotoxic effects of the element uranium.